SET last_post_date = ?, last_user_posted = ? SET topic_reply_date = ?, topic_last_user = ? 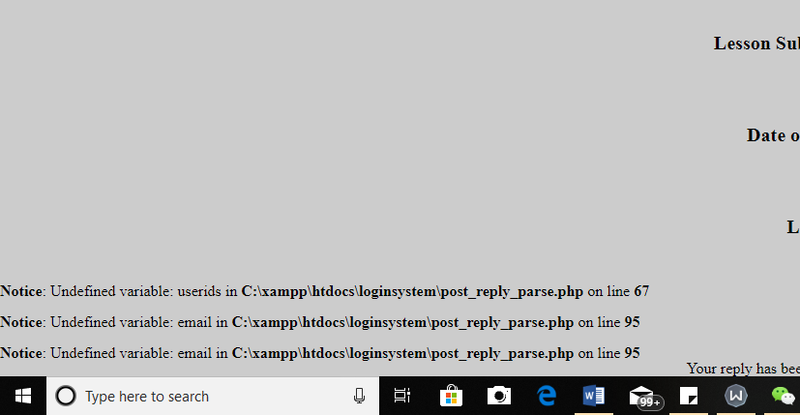 The error says email and userids are undefined variables. Find them and check why you’re calling them before defining . thanks… I think in the video tutorial, he didn’t define the variables… should I do something like $userids=array();? Will that work before calling $userids? What are you expecting the above line to do? It should store the post creator username in an array… i have got that working by defining it as $userid = array () but for some reason, the $email variable is not defined? If $email is undefined and you think it should not be, can you reference which line number you think gave $email it’s original value before line #95? I think the video tutorial forgot to define the variable but if I just add $email=""; at the very top of the page, then it works… I hope this is correct?